There are very few cities in the world that can match the history and heritage of Agra - the city of Taj Mahal. Located at a distance of 204 km south of Delhi, Agra is one of the most famous travel destination of India. Situated on the west bank of River Yamuna, Agra is a part of the great Norther Indian plains. Travel to Agra to explore the architectural splendor of Agra India which is reflected in the glorious monuments of medieval India built by great Mughals who ruled India for more than 300 years. In the mid 16th century and earlier 17th century Agra witnessed a frenzied building activity and it was during this time when the symbol of love Taj Mahal was built in Agra. The buildings made during this era were purely in the contemporary Mughal style and of very high quality which is still reflected in what ever monuments remain in Agra. » Agra Red Fort - Built principally as a military establishment by Akbar in 1565, the red sandstone Agra fort was partially converted into a palace during Shah Jahan's time. » Sikandra - Travel Four kilometer from Agra to reach the mausoleum of Akbar. Construction of this beautiful monument was started by Akbar himself. This structure has a perfect blending of Hindu, Christian , Islamic, Buddhist, Jain motifs. 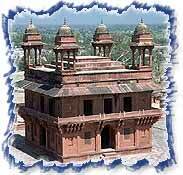 » Fatehpur Sikri - 37 kms from Agra is built a city predominantly in Red Sandstone called Fatehpur Sikri. This town was built by the Mughal Emperor Akbar. He had planned this city as his capital but shortage of water compelled him to abandon the city and within 20 years the capital of Mughals was shifted to Lahore. » Mathura - Krishna, one of the incarnations of Lord Vishnu was born here. Mathura, which is one of the major Pilgrimage for the Hindus is 58 Kms from Agra. It comes before Agra if travelling from Delhi. Agra is not only a famous travel destination but is a shoppers paradise too. There are plenty of shopping areas and shopping malls where one can buy the specialities of the place. The city of Taj, Agra is one of the hottest tourist destinations in India and all facilities have been provided for the easy access to this place. Agra is boast of its own airport and connects the city to all the major places in India. Agra is also connected by trains to almost every corner of the nation including the luxury train the Rajdhani and Shatabdi. One can also avail the excellant bus services to Agra in the state as well as outside the state. The state transports have deluxe as well as ordinary bus services for the place. Agra is one of the major tourist destination, where international tourist inflow is also quite good. So the options of luxurious accommodations are plenty. If you are a budget travellers, there are numerous tourist lodges as well mid-range hotels in Agra. 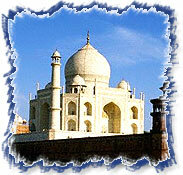 Grab the best travel package deals offered by Agra Travel Agent for travelling in Agra India. Check out these tour operators/travel agents & choose according to your travel need. Planning a holiday in Agra! Get some of the best Agra tour packages and to die for Agra travel deals. 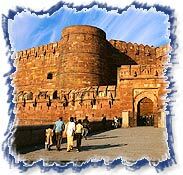 The must grab Agra travel package includes the Taj Mahal and other monuments in and around Agra.